Let’s take a look at what has been found up to this point in time. These are the popular fossil representatives we see in school textbooks, museums, and zoos. In 1860, during the lifetime of Charles Darwin, the fossil of a man who didn’t walk completely erect was found. This fossil was called the Neanderthal Man. Eventually, further analysis of certain Neanderthal Men showed the fossils were not from primitive ape-man, but possibly skeletons of modern men with signs of arthritis and rickets, a condition due to lack of vitamin D. Neanderthal Man was a man and not an in-between form. In 1912, an ape-like jaw and a human skull were found close together, and scientists named this fossil the Piltdown Man. By 1950, scientists did more observation, and they found that the human skull and ape jawbone of the Piltdown Man were treated with chemicals to look old. Furthermore, the teeth on the ape jawbone were mechanically filed to look like human teeth. Piltdown Man is not an in-between form. In 1922, scientists created the Nebraska Man when they found one tooth. Nebraska Man is not an in-between form. About 60 years ago, a fossilized jaw and a few teeth were found in India, and scientists named this fossil, Ramapithecus. Since that time, scientists have agreed that Ramapithecus is not an in-between form. And there is Java Man, discovered by Dr. Eugene Dubois. Dr. Dubois eventually declared the fossil of Java Man to be an ape-like creature and scientists no longer consider Java Man as an in-between form. Then there is the Cro-Magnon Man, which was later identified as a modern European man. Finally, there are the Peking Man fossils, which were lost in 1941. In short, none of these fossils can support the evolution of apes to men. They were either fossils of apes or fossils of men. None of them are accepted today as in-between forms. Oswald Chambers wrote, "If the Bible agreed with modern science, the Bible would soon be out of date." Folks, the Bible is the trustworthy Word of God. And the Bible tells us that God created mankind. The second observation, I want to make, is related to the first, and that is that Adam, the first man, was not only created by God, but he was created in God’s image. God made mankind superior over all other living creatures. We are given the authority to rule them. Furthermore, we are made in the image of God. Unfortunately, we don’t know for sure how we were like God before the disobedience of Adam and Eve. Since none of us have seen God, and the Bible’s description of mankind comes primarily after the disobedience of Adam and Eve, we can only make some studied guesses at what being made in the image of God means. I believe that we were created as physical beings like all other animals. But we are made in the image of God in that we were also living spirits, which enables us to relate intimately with God, who is Spirit. 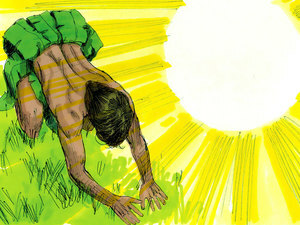 But when Adam and Eve disobeyed God, our spirit died, and we were left with our physical body. We read in Genesis 2:17, "But you must not eat from the tree of the knowledge of good and evil, for when you eat of it you will surely die." And Genesis 3:7 tells us the immediate difference after Adam and Eve ate the fruit, "Then the eyes of both of them were opened, and they realized they were naked." With the death of their spirits, all Adam and Eve could see were their physical bodies. Since the time of Adam and Eve, all of mankind is born physically only. We can only be born spiritually later in life by the work of God’s Spirit. Jesus said in John 3:5-6, "I tell you the truth, no one can enter the kingdom of God unless he is born of water and the Spirit. Flesh gives birth to flesh, but the Spirit of God gives birth to spirit.” John 7:38-39 tells us, "Whoever believes in Jesus, as the Scripture has said, streams of living water will flow from within him. By this, he meant the Spirit." receive the Spirit of God through trust in Jesus Christ, you are only a physical being, without your living spirit to relate to God. The title of this message is, "Real Men Relate to God." Real men have the image of God restored in them, so they can relate to God. And the Bible tells us our spirit can only be made alive by God’s Spirit through belief in Jesus. With the remaining time, we’ll look at three ways real men (and women) relate to God. First, real men are accountable to God. We read this in Genesis 1:28, 2:15-17 and 3:6. God gave Adam authority and freedom to manage the creation. The only rule God gave to Adam was that he would not eat from the tree of the knowledge of good and evil. Yet, Adam disobeyed, and he became less of a real man. Each day that we live without regard for God, we become less of what God intended for us. How we handle our relationships with others and how we handle our possessions in life matters to God. God is the Creator and Owner of all. We are His managers.Managers are accountable to the Owner. Real men recognize God is in charge, and in the end, we will answer to God. If you want to be a real man or woman, live your life knowing that you will eventually answer to God. We will answer for every thought we think, every word we speak and every action we take or omit. Second, real men admit failure to God. We read this in Genesis 3:6-12. God asked Adam, "Have you eaten from the tree that I commanded you not to eat from?" Adam replied, "The woman you put here with me - she gave me some fruit from the tree, and I ate it." Adam was the first to play the blame game. He didn’t admit that he did wrong. He tried to shift the blame onto Eve.When Adam didn’t admit failure to God, he became less of a real man. Real men admit failure, mistakes and willful disobedience to God. If you want to be a real man or a real woman, confess your wrongs to God first. Third, real men accept help from God. We read this in Genesis 3:21. God helped Adam, and Adam accepted help from God. God killed and shed the blood of animals to cover the guilt and shame of Adam’s failure. It wasn’t that Adam and Eve could see through the fig leaves, so they needed animal skins. God gave them animal skins to show the cost of forgiveness. Hebrews 9:22 tells us, "In fact, the law requires that nearly everything be cleansed with blood, and without the shedding of blood there is no forgiveness." The shedding of animal blood was a foreshadow of the complete and final forgiveness for mankind’s sin through the shedding of Christ’s blood. Jesus Christ said in Matthew 26:28, "This is my blood of the covenant, which is poured out for many for the forgiveness of sins." Real men accept help from God. If you want to be a real man, allow God to help you. Receive the blood of Jesus Christ for the forgiveness of your sins. "To His presence I am blind. . . . In the glory of the spheres." "Have you looked at Calvary? If you don’t know God, it’s because you’ve not considered Calvary. Calvary was the place where Jesus was crucified for the forgiveness of our sins. On Calvary, God offered the only solution for restoring men to real men. And yes, for restoring women to real women, also.